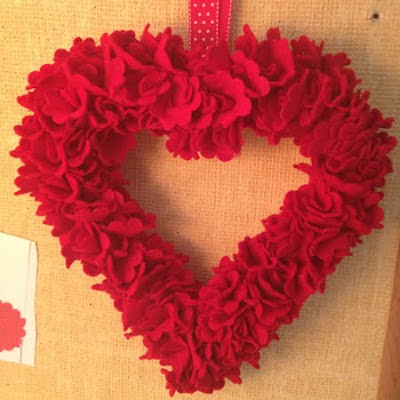 Heart Felt Wreath - I did it! | Midnight Crafting Midnight Crafting: Heart Felt Wreath - I did it! Yes, Pinterest... All ideas and no execution, right?? Well, most of the time... But not today!! My crafty group is getting together later this month to make these cool felt heart wreaths found on Pinterest, full tutorial online there... and I happened to be gathering the supplies so I had the felt on hand here. I am waiting on the 12" foam wreaths to come in stock ((call before you go, #justsayin)) but I did manage to pick up a little 9" one I thought I would make for fun. I am not big on hand cutting felt, and this project calls for ALOT of felt circles. I knew I had a circle die cut for my Big Shot.. (now, it IS retired - but you could totally use the current one, its a smooth edge 3" die, which would actually give you the look of the Pinned project) but I used Scallop Circle #2 and went to town cutting felt. I used just over a yard of a 72" bolt of felt, and with my crafty cutting I got two sizes of felt circles, just under 200 pieces each. The die has a 2" scallop circle, which I used on the wreath I'm going to show you, and it has a 3.5" scallop circle which I will use for the group craft and the 12" wreath. 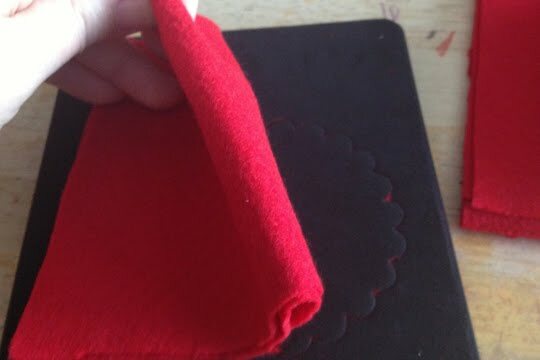 I folded my felt to 4 layers - 4 is good! 5 is tough - Dont do six! The Big Shot really did fine with the felt, I cut 4 layers at a time, and it took about 1 hour. 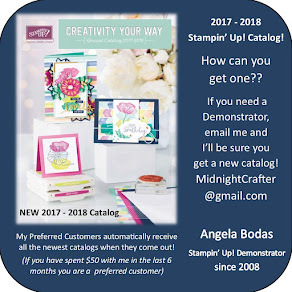 Not bad - no tracing circles, or hand cutting with scissors... Yay!﻿ Time- saver!! Which was good, because the next step also took an hour! 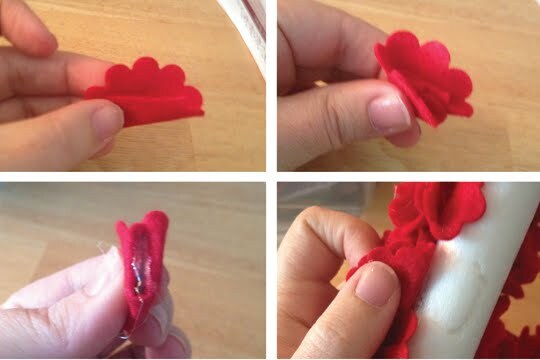 The tutorial calls for pins to attach your felt to the wreath form, and I have no idea how that would work - I didnt get pins, and had planned on using hot glue. 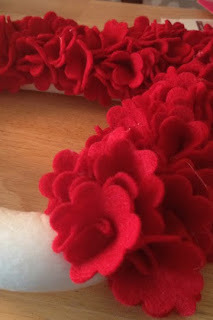 The hot glue worked just fine, and actually gave me some help in forming the look of the felt on the wreath. I think with the pins I probably would have needed more circles to get more coverage, but perhaps its the same idea... I followed the tutorial, with the exception of the scallop edge felt circles and the hot glue instead of pins. Looks like little roses! Love it!! And don't worry about being too fussy about perfect scallops - I folded the "bad" edge to the inside, then used that as the glue edge for attaching to the wreath. Once on, you can't even tell! I attached the hanger with hot glue also. 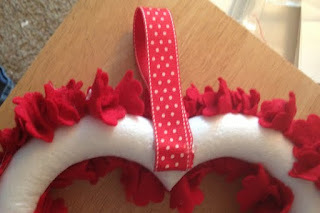 When I was gluing pieces onto the front of the wreath I did about 3 across, sometimes 4, you just want to eyeball it - you definitely dont need to do alllll the way around the wreath. When its hanging it totally gives the illusion of being complete. You would need a bajillion more circles, and it would take twice as long... but you could, if you really wanted to. And Voila!!! 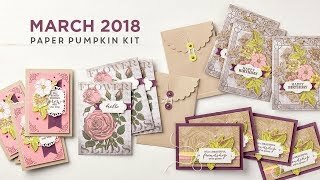 Beautiful (if I do say so myself) and easy to make!